One film that I definitely am dying to see this year in Lars von Trier's "Antichrist". The film has recieved an enormous amount of buzz based off the shocking nature to the film and the latest poster is a verbal reminder of that buzz. The new poster is simple with critic reviews pasted down the middle. The poster also reminds the on-looker exactly why the film is rated R. The poster is perfect because it will definitely weed out people who would be turned off by the film anyhow. The trailers are a bit deciving and this new poster is much better for giving clear indication of what you can expect in von Trier's latest. 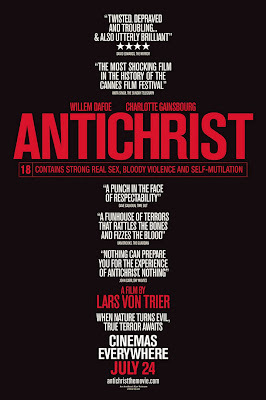 "Antichrist" stars Willem Dafoe and Charolette Gainsburg and is set for a October 23rd release. Have a look at the new poster below and I through in the previously released trailer for any of you who have not seen it yet.